Friday’s price action on the dollar to yen daily chart ended the session on an enormous up bar totally at variance with the technical picture which to all intents and purposes pointed to yet further sideways consolidation. This week is an interesting for fundamental news on the economic calendar for both the US and Japan. So far today we have had 6 releases for Japan, starting with the Core Machinery Orders which came in much better than expected at 9.7% against a forecast of 2.8% and ending a three month run of declines. This was followed by bank lending, current account and M2 money supply where once again good news was the order the day as they all came in better than expected. 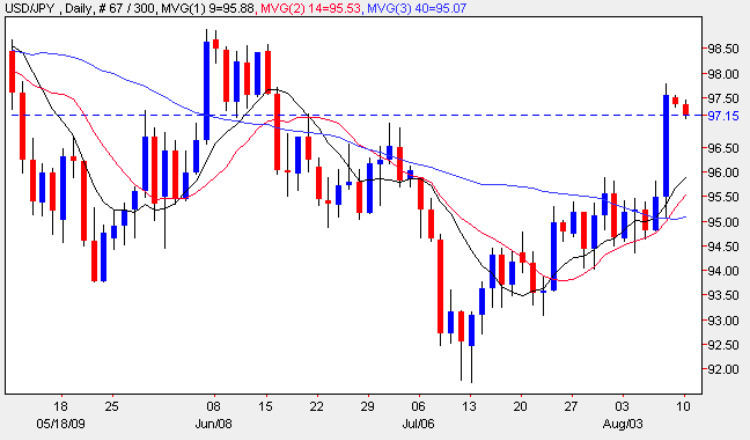 In the early hours of the European session the Japanese news continued with the Economy Watchers’ Sentiment Index which sadly failed to continue the positive tone, falling short of estimates of 43.4 by coming in at 42.4. The morning rounded off with Preliminary Machine Tool Orders which came out at -72.2%, a marginal improvement on the last time. There is nothing of note in the US until Wednesday’ FOMC meeting but the news from Japan continues on and off all week and includes a two day meeting by the BOJ to decide on interest rates which markets widely expect to remain at 0.10%. From a technical perspective whether Friday’s dramatic breakout is likely to continue depends on the deep resistance now ahead between the 0.98 and 102 price band and any effort to break through here will require a huge degree of both force and momentum.